In order to take a break from all this environmental thinking we've been doing, let's talk picture books. 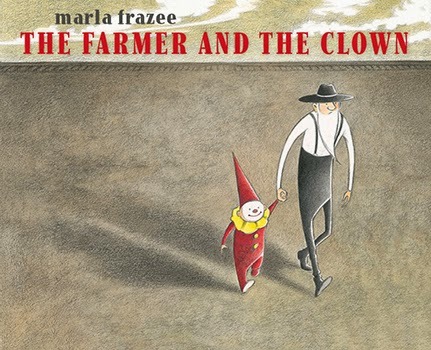 I'd heard of The Farmer and the Clown by Marla Frazee, and it's a book that does live up to its hype. The story of the farmer who sees a little clown fall from a circus train and takes him in is told totally in pictures. It's one of the easiest to follow wordless books I've ever seen. I "read" this is as a sad story about the farmer. But when I finished, I looked at the front flap and found a much more upbeat interpretation, one I think that works. One that's much more from the clown's point of view. So two stories going on here, all without a word. 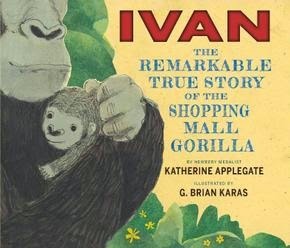 I snatched up Ivan: The Remarkable True Story of the Shopping Mall Gorilla by Katherine Applegate with illustrations by G. Brian Karas because I'd already read Applegate's The One and Only Ivan. My interest was in seeing an author use the same material in different ways. The picture book really is quite good. I almost thought I might like it better than the novel, but than I remembered Ivan's voice in The One and Only Ivan. Both novel and picture book are very well done.